I was not at all on expert on anything about the Netherlands before I started researching for this trip. Embarrassingly enough, my knowledge was limited to the canals of Amsterdam, legal weed, and the Red Light District. It wasn’t until after we booked our flight that I learned the Dutch are famous for their tulips and windmills, as well. That is how I came across Keukenhof Garden, and upon seeing the pictures of it on Pinterest and Flickr, I knew there was no way I was spending a weekend in the Netherlands without going to Keukenhof. I warn you, there are no words to describe the beauty of this garden, so I will rely on a lot of colorful pictures of pretty flowers to do the work for me. Keukenhof is one of the largest flower gardens in the world, with approximately 7 million flower bulbs planted each year, according to their website. 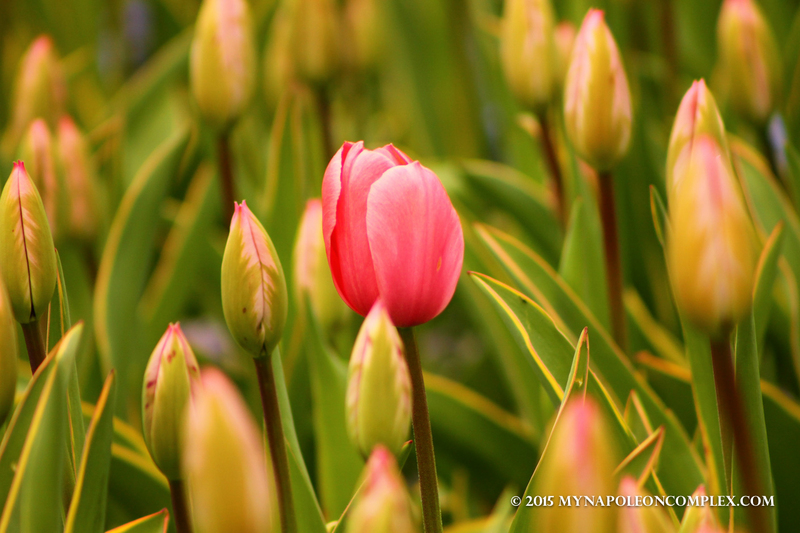 It is only open for eight weeks a year, from April to May, the season for tulips. Because of the weather, it is very difficult to predict when the perfect peak time to go will be. For example, most websites say that mid-April is the best time to go because the tulips are in bloom and the trees have also started to flower. But even though we went exactly in mid-April, it was still pretty chilly and a bunch of tulips had yet to flower. But whether you go too early or maybe a little too late, if you want to see tulips, I guarantee you, you will see so many that you’re head will spin. There are also pavilions spread throughout the park that act as sort of specialized greenhouses for different flowers. As I mentioned above, if you are too early or too late to see the tulips in bloom throughout the fields, you will always see hundreds of tulips in the greenhouses. We went to the Beatrix pavilion (finally, a country that values my name! ), which contained orchids of every size shape and color imaginable. And we also went to the Oranje Nassau pavilion, which was all about the tulips. 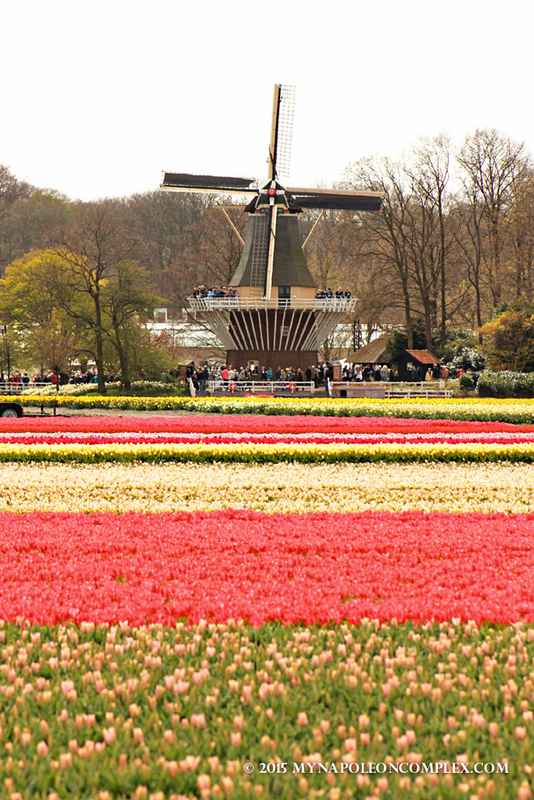 There were so many tulips there that by the end of the day, poor Jaime never wanted to see another tulip in his life! The Juliana pavilion was also the center for “Tulpomania” where you learned about tulips and tips and tricks to grow them. Keukenhof also has its own windmill and throughout the gardens you will find a lot of oversize traditional Dutch clogs, so the photo opportunities are absolutely endless! There’s also a lake, complete with swans and ducks! And then the many different walking paths with tulips. 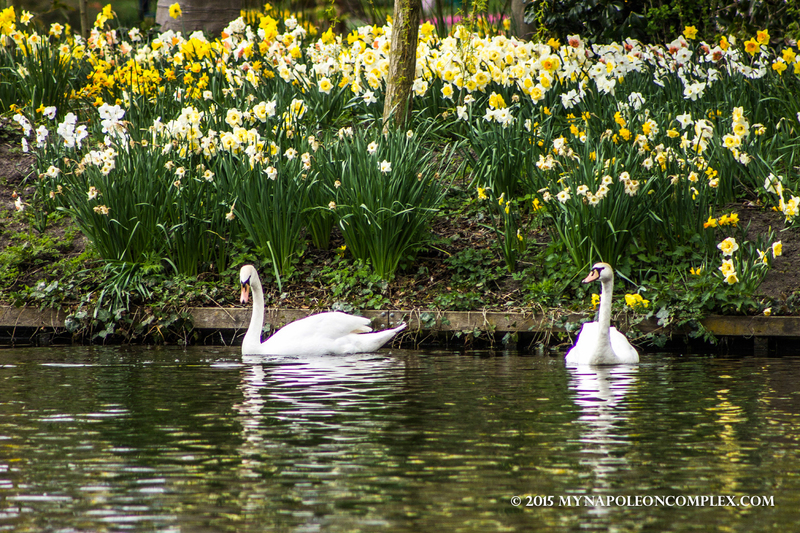 Apart from tulips, you will also see hyacinths, hydrangeas, roses, and daffodils, even cherry blossoms! Plan to be at Keukenhof a bare minimum of four hours, but really, you can be there all day and probably not see everything. If possible, also avoid going on the weekends (specially Sunday) and arrive early, as it can get pretty packed. We went on a Friday, arrived by 10:30 am, and while there were a lot of people, it wasn’t to an extent that it would make the experience less enjoyable. 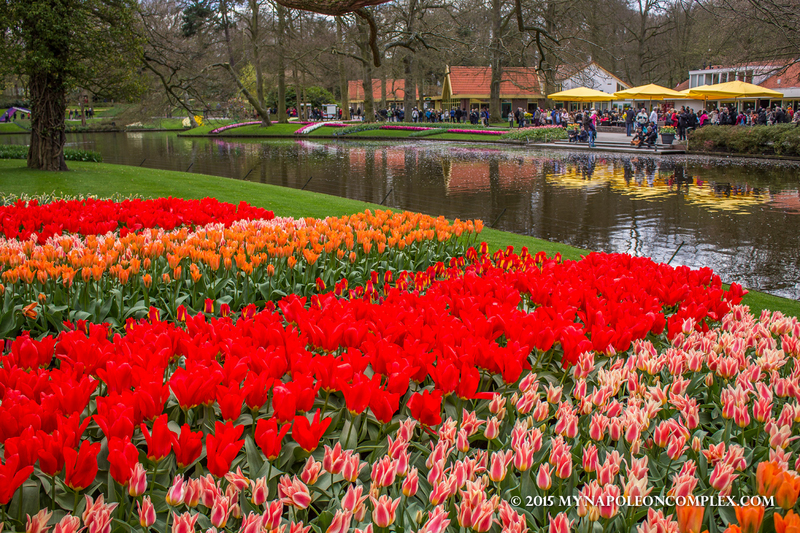 All in all, if you are in the Netherlands in April or May you must go to Keukenhof, it was the highlight of our weekend! To get to Keukenhof (located in Lisse) from Amsterdam, you have several different options: you can take a train from Amsterdam’s main train station (I believe it’s 45 minutes), you can also rent a bike and bike to Keukenhof (not from Amsterdam, but probably starting from Haarlem, depending on how much you want to bike). This would probably be a good way to partake in some cycling along with tulip fields. We decided to rent a car from Amsterdam. The drive is really 45 minutes to an hour, and we took the famous Bloemen Route (Flower Route) to try to catch some of the tulip fields surrounding Keukenhof. As I mentioned above, we were a little bit early in the season, so while we did see the fields, most of them had not yet bloomed to form the famous stripes of tulips. We also got to take a picture of the Keukenhof windmill from the outside, where coicidentally there were some tulip fields as well. While we weren’t able to see the endless fields of tulips we dreamed of, renting a car was still a pretty good deal for us considering we were four people. It also gave us an opportunity to take advantage and drive on to a famous Dutch UNESCO site, but I’ll leave that for the next post!